Bookmarking helps to save the interesting web pages on our computer for future reference. This feature is very helpful because users can come back later and continue reading the interesting page by opening previously saved bookmarks if they don't have enough time to read right now. You can bookmark an interesting webpage either on the browser itself or on a third party website which supports this facility. This tutorial explains the bookmarking feature on Google Chrome browser and the different methods to remove any unwanted previous entries. To save an interesting webpage on Chrome browser, you may follow the steps below. Once you are on the page which is needed to be saved, click on 'Customize and Control' button on the right-hand top. It is important to make sure while pressing this button, you are on the right page to save. You can also save a specific webpage on Google Chrome by pressing the two buttons at the same time. The shortcut keys to press are: [Ctrl] and [D]. In my personal opinion, I prefer to use this keyboard shortcut to save a preferred page. You can view all saved web pages on your Google browser by either GUI method or by shortcut keys. To view the bookmark manager, press [Ctrl] [Shift] and [O] buttons together. It will open a new window where you can manage and view all saved bookmarks. Click on 'Customize and Control' Button and open Bookmark Manager. Here all the saved entries are listed. People lose interest over time. In case if you want to remove some of the previously saved web pages from Google Chrome browser, it is very easy to do. 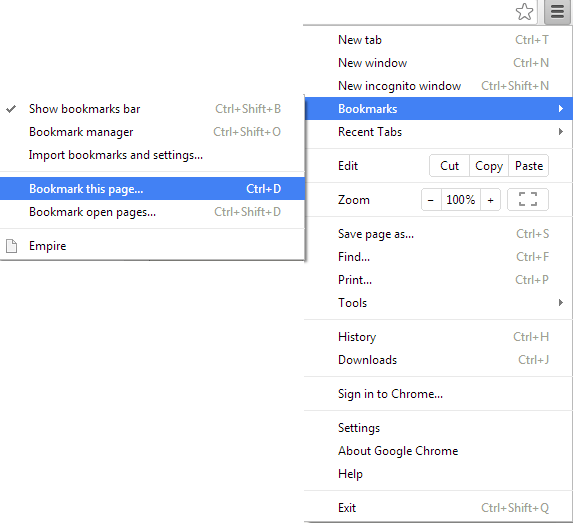 Following steps explain how to delete saved bookmarks from Chrome browser. You can directly access the same bookmark manager by pressing [Ctrl] + [Shift] + [B] keys together. In the book manager window, you can see all the saved bookmarks on Chrome. To delete an entry, select the item and press delete button on your keyboard. If you want to delete the all entries you may press [Ctrl] and [A] button together and press delete button. Then all the saved bookmarks will be removed from the Google Chrome browser.